Color Anodizing of Aluminum Automotive Products & Parts | Modern Metal Finishing Inc.
A manufacturer of high performance automotive parts needed a cost effective, quality resource for color anodizing their products. They turned to us for our reputation as a leading provider of color anodizing, our years of experience, and advanced processes that have built our reputation. The components shown here are composed of 6061 T-6 aluminum, and measured under 10". 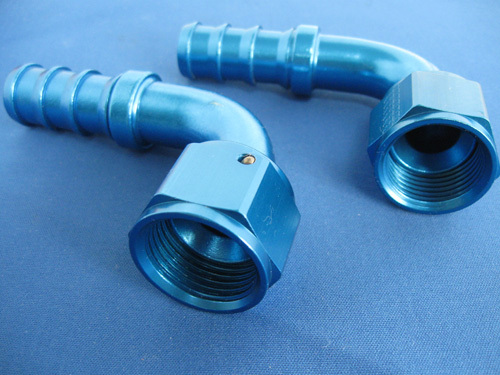 To achieve the finish that the customer required, as well as adherence to MIL-A-8625F, Type II - Class 1 & 2, we ran the job using a type 2 anodizing process. 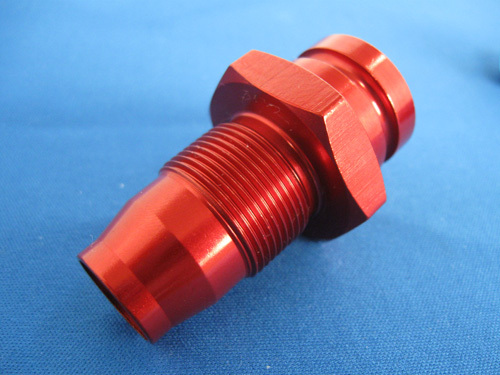 The finished parts featured a bright blue or red anodized finish, which was completed on our dedicated rack anodizing line. Complete inspections were performed during the entire process to ensure that the quality was consistent, and in line with our high standards. To learn more about this product, see the table below or contact us directly. 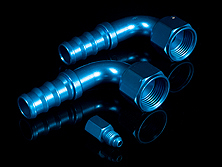 These aftermarket performance products are used in automotive industry.